WELCOME! NAPHA's Website goal is to document approximately 1000 defunct amusement parks in the United States and Canada. While most of the amusement parks were closed long ago, the site will include a few dozen operating parks like Kennywood, Cedar Point and Hershey Park that have had long, interesting histories. Obviously, researching and documenting this many parks will take a good amount of time and will require the efforts of many NAPHA volunteer historians to achieve the goal. Death of the park owner and family members having no interest to continue. Material restrictions during major conflicts caused many parks safety and appearance to decline and eventually close. I've included a list of defunct parks, by state, and whether I was able or unable to find information. A good source for information may be the local historical society for small obscure parks, some of the many Arcadia Publishing amusement park books, or through history books for specific parks. If an article is finished, the link in the state list will be active. To begin with, there are only two articles as examples; Elitch Gardens in Denver, and Golden City in New York. The layout for each park’s history will consist of a researched and accurate text, together with photos of the park’s attractions. These can be a mixture of color postcards and B&W photos. There will be a small clickable window for a park map, which will open a separate scrollable window to view the larger map; usually a Sanborn fire insurance map. Very long articles will be divided into historic periods. The project began when I acquired over 200 Sanborn Fire Insurance maps nearly 18 months ago. By comparing lists of roller coasters and parks from a variety of sources, the list grew to about 1000 lost amusement parks. Of course there were several hundred other parks dismissed, because while they had a dance hall, restaurant, theater, carousel, bandstand and picnic grove, they never developed into a full-fledged amusement park with a group of rides like a shoot-the-chutes, scenic railway, old mill, circle swing and assorted attractions. Your name will be on the article. Text can be in Microsoft Word or Wordpad format; photos in .jpg format no larger than 650 pixels on the long side, for they must fit on the page and take up little hard drive space for fast downloads. Send E-mailed photos as attachments. Please don't copy Wikipedia or other Web site articles verbatim, or even books. The best source of history is local newspapers, often on microfilm or online. For example the Fulton Historical Society in New York has 17,000,000 newspaper pages online with a search engine. Then when you write your article you can blend all your source material together into an informative article. Description of rides are very important. Jim Abbate is in charge of the main Lost Amusement Park Page on NAPHA’s main Website and will control the park lists and links to the library side of the project. QUALIFICATIONS! I’m 66 years old, semi-retired, and live in Los Angeles. I grew up in Pittsburgh and visited Kennywood Park during annual school picnics as a child in the 1950s. My grandfather owned a travelling carnival and my parents would take me to visit it when he was in town. Having a moderate fear of height when I was 5 years old, I screamed until they reversed it and took me off his Ferris wheel, so I didn’t ride my first roller coaster until I was 14 years old (the Jack Rabbit at Kennywood). However, at my age, I find riding modern looping coasters stressful, but I do ride all of the roller coasters at Disneyland / California Adventure since I'm a season pass holder. I received two mechanical engineering degrees from Rensselaer Polytechnic Institute in Troy, NY, and planned to design industrial robots or amusement park rides when I graduated. But I was fortunate enough to find a place in California’s aerospace industry in 1969 as a rocket scientist. After four aerospace layoffs with long periods between jobs, I changed careers. I worked as a photographer for several years, started a postcard company to promote my work in 1979, and with too much free time, designed computer games and wrote several textbooks on arcade game design in the early 1980s. I was forced out of the computer game consulting business when I passed the age of 40 in 1986. Since then, I have written an unpublished Coney Island book with a 450 page text. Adding hundreds of photos will make it a very big book. Finding a publisher has been difficult because every publisher I submitted it to wants to publish a quick picture book with no more than 5000 word text. My best hope is a university press within 100 miles of the resort. The book describes all the attractions at Coney Island and how the rides work, besides covering the usual history of the famous resort. It will have a dozen 3D aerial perspective maps that show the layout of Coney Island’s three main amusement parks including the interior of Steeplechase’s Pavilion of Fun, and I am looking for additional photos of attractions to illustrate the book. 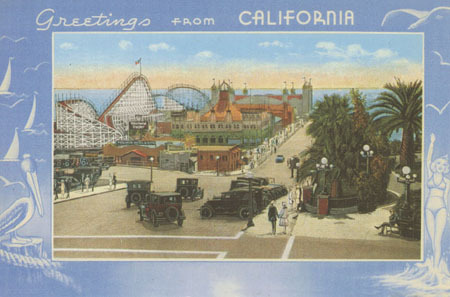 Thank you in advance and I hope you have a wonderful time travelling through our "Lost Amusement Parks." Enjoy!